Smartphones have grown powerful enough to enable reporters to shoot, edit and publish high-quality news reports on the go, whether they are producing material for broadcast or online audiences. Over the last few years, Journalism.co.uk has reviewed countless apps and tools for journalists working out in the field, all while analysing audience engagement trends across multiple platforms. It has become clear that audio is an integral part of storytelling, whether you are carrying out a piece to camera, filming interviews or just capturing the atmosphere at a news scene. In fact, multiple studies have shown that audiences are more likely to put up with bad quality video than they are bad audio, but how can reporters achieve this when they're shooting material on the go? 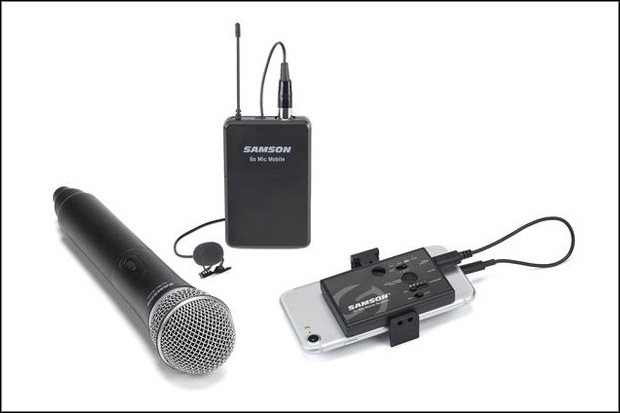 Go Mic Mobile® is a professional wireless microphone system designed to enable users to capture quality audio wirelessly using their smartphone. Reporters simply mount a small receiver to their mobile device, plug it into their phone, and start recording – for up to 13 hours of battery life. They can choose from two microphone transmitter configurations: an omni-directional lavalier with beltpack, or handheld mic, which can be used on their own or simultaneously. "We have seen the quality of smartphone video dramatically improve to where it can replace a camera, but the built-in microphones on these devices still haven't caught up with this technology," said Sean Meagher, director of marketing, Samson Technologies. With iPhones, the Go Mic Mobile seamlessly integrates with the native camera app, and can also work with apps such as Filmic Pro and social media platforms. Because of the variations in Android hardware and operating systems, users should open a third party video app.